Dark red with purple tints around the edges. Aromas of dark rich berries, dried herbs and earthy tones introduce this medium bodied Cabernet Sauvignon. Mid-range tannins are supported by cherry, plum and blackberry fruit followed by hints of oregano and bay leaf. Great structure and good acidity combine with a spicy finish. 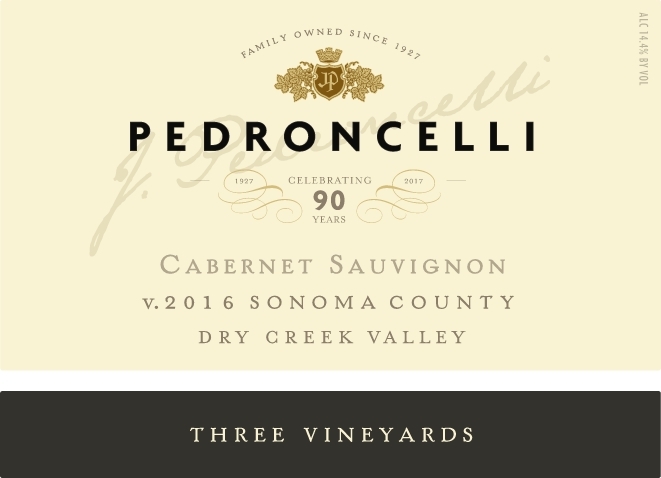 2016 "Three Vineyards" Cabernet Sauvignon - Enobytes.com - 88 Points "This is a medium-bodied crowd pleaser with aromas and flavors of blackberry jam, cherries, Coca-Cola, and vanilla. It finishes with pleasing, lingering herbaceous notes with a tinge of vanilla and smoke."